As the construction industry finishes a strong 2017 and economists expect continued growth in 2018, Mack Trucks announced a new loyalty reward card for Mack Granite customers and National Ready Mixed Concrete Association (NRMCA) members. Mack made the announcement during World of Concrete 2018, Jan. 23-25 at the Las Vegas Convention Center. As the construction industry finishes a strong 2017 and economists expect continued growth in 2018, Mack Trucks announced a new loyalty reward program for National Ready Mixed Concrete Association (NRMCA) members who purchase Mack Granite models. 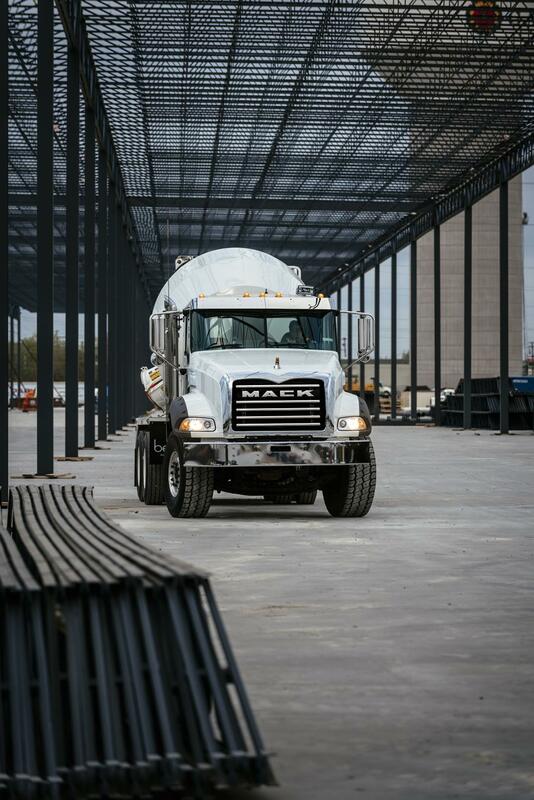 Mack made the announcement during World of Concrete 2018, Jan. 23-25 at the Las Vegas Convention Center. The Let's Build! Mack Trucks Parts and Service Loyalty Reward Program offers NRMCA members with a $1,000 parts and service reward for Mack Granite models purchased between Jan. 12, 2018, through June 30, 2018. Customers are eligible to receive the reward for up to 10 Granite models at participating Mack dealers. Along with single-family housing starts, public construction also may increase in 2018 if a new $1 trillion, 10-year highway bill to improve roads and infrastructure passes. Many construction projects remain ongoing, too, as a result of national disasters that occurred in 2017. The Mack Granite, Mack's ultimate workhorse, and the No.1-selling heavy-duty conventional straight truck in the United States for four years in a row, features an all-new interior engineered to help customers attract and retain drivers. The new gauge cluster and dash layout in the Granite model improves visibility and readability. Frequently used controls are within reach of the driver's fingertips. Switches were repositioned higher on the dash, and the Mack mDRIVE automated manual transmission shift pad is now within easier reach for the driver. The dash panel can accommodate 18 easy-to-read switches, which now have laser etched labeling to prevent them from being worked off, even with repeated use. The Mack Granite model delivers enhanced performance and driveability for concrete mixer applications when equipped with a Mack MP7 11-liter engine and the Mack mDRIVE HD 14-speed automated manual transmission with creeper gears. The mDRIVE HD with creeper gears is approximately 150 lbs. lighter than an automatic transmission. Mack Granite models for concrete mixer applications also come standard with Mack ClearTech One, a single-package Exhaust Aftertreatment System (EATS) that frees up frame rail space and reduces weight by approximately 17 lbs. With Mack ClearTech One, the diesel particulate filter (DPF), selective catalytic reduction (SCR) technology and diesel exhaust fluid (DEF) dosing system are all combined into one unit. With the rail space gained, customers have more space to add water tanks and chutes with more wheelbase flexibility than before. All Mack Granite models are backed by Mack GuardDog Connect, Mack's proactive diagnostic and repair planning system. The telematics system monitors fault codes that could potentially shut down a truck or lead to an unplanned visit to the dealer. GuardDog Connect enables quick diagnosis of issues, proactive scheduling for repairs and confirmation that needed parts are in stock and ready to install, all while the truck is still on the job. Along with Uptime support, Mack has also made significant strides to simplify body builder support services. Mack has a focused body builder support group that offers prompt access to Mack product experts who can answer questions that may arise while spec'ing a truck or during the body upfit process. The group also addresses customer inquiries after a vehicle is in service.